The Allegheny River runs 325 miles long through Pennsylvania and New York. The river enters New York State at the Cattaraugus-Allegheny county borderline and meanders west for about 55 miles before returning back down to Pennsylvania. At the Point in Pittsburgh, the Allegheny River becomes a tributary along with the Monongahela River to form the Ohio River. The Allegheny River was named after the Delaware Tribe moved to Western Pennsylvania in the 18th century and displaced the Iroquois Tribe who previously lived there. The Delaware translated the previous Iroquoian name "Ohio" into Delaware, Their translation welhik-heny meant "most beautiful stream." The name Welhik-heny was then anglicized as Allegheny. The river has a series of locks and dams that make it navigable for industry. 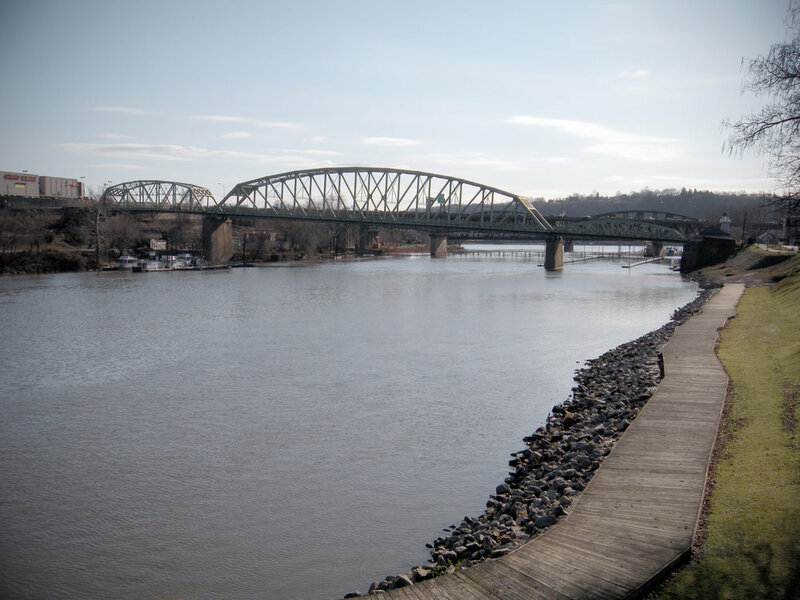 The Monongahela River runs 130 miles long through West Virginia and Pennsylvania. The river begins in Fairmont, WV as a confluence of the Tygart and West Fork Rivers and flows north to the West Virginia-Pennsylvania border and up into Pittsburgh. At the Point in Pittsburgh, the Monongahela River becomes a tributary along with the Allegheny River to form the Ohio River. "Monongahela" is a Native American word for “falling banks,” referring to the river's unstable geological banks. In the 1930s, a severe drought caused the river to dry up. The river has a series of locks and dams that make it navigable, making it a major barge route and a minimum depth of 9 feet. The Ohio River runs 981 miles long starting at the Point in Pittsburgh, Pennsylvania and ending in Cairo, Illinois, where it then flows into the Mississippi River. The Ohio River flows through or borders six states including Illinois, Indiana, Kentucky, Ohio, Pennsylvania, and West Virginia. It is the source of drinking water for more than three million people and over 25 million people, almost 10% of the US population, live in the Ohio River Basin. The Ohio River received its name from the Iroquois meaning "the great river." Despite the introduction of railroads and highways, the Ohio River is continuously an important route for transporting bulk goods. During the 1600s and 1700s, the Ohio River served as the southern border of the Northwest Territory. The Beaver River runs 21 miles long through Pennsylvania and is a tributary of the Ohio River. Beaver River is formed in Lawrence County, Pennsylvania by the confluence of the Mahoning and Shenango Rivers. Beaver River meets the Ohio River between the towns of Bridgewater and Rochester, Pennsylvania at the a sharp bend in the Ohio approximately 20 miles northwest of Pittsburgh, Pennsylvania. The river is a namesake for Beaver County, Pennsylvania, which it flows through. The river was either named for King Beaver of the Delaware Tribe, or for the animal itself. The Shenango River runs 100 miles long through Pennsylvania and Ohio. It is a tributary for the Beaver River in Western Pennsylvania. "Shenango" is derived from the Iroquoian word "Shanango" which means "the beautiful one." For more information on local water quality, visit..